Dun & Bradstreet, which grows the most valuable relationships in business by uncovering truth and meaning from data, today announced that its Composite Business Optimism Index stands at 91.0 during Q1 2018, an increase of 18.6% as compared to Q4 2017. 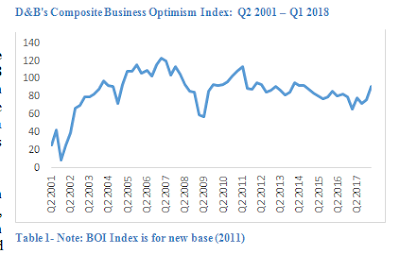 All key (six) optimism indices have registered an increase as compared to Q4 2017 as well as Q1 2017. He further added that as the global economy is expected to pick up steam during the year, India should stand to gain. “Favourable interest rate differential and continued reforms for improving ease of doing business provide favourable ground for domestic and foreign investors. For business confidence to get a sharp boost from here on, government measures on reviving investments and demand should result in further acceleration. The upcoming Union Budget should be pragmatic and growth oriented rather than fiscally stringent,” he said. The key survey findings are: 78% of the respondents expect volume of sales to increase in Q1 2018 compared to 59% in Q1 2017, an increase of 19 percentage points. While around 16% expect it to remain unchanged, 6% expect the volume of sales to decline.